Cauliflower is a nutritious vegetable, belonging to the same family as broccoli, kale and cabbage. Cauliflower consists of a white curd-like head surrounded by large green leaves that are often removed and used to make soups and stocks or discarded. Cauliflower which has a delicate, sweet nutty flavor, is low in calories and provides an excellent source of Vitamin C, and a good source of dietary fiber, omega 3 fatty acids, minerals such as manganese, potassium and phosphorus, and vitamins K, B1, B2, B3, B5 and B6. Cauliflower is best eaten cooked, but should only be cooked lightly (blanched or sauteed) to retain crispness and prevent the odorous sulphur compounds from escaping. It is an annual plant that reproduces by seed. Typically, only the head (the white curd) of aborted floral meristems is eaten, while the stalk and surrounding thick, green leaves are used in vegetable broth or discarded. Cauliflower is nutritious, and may be eaten cooked, raw or pickled. Food complements: Cream, Nutmeg, And beef all complement cauliflower. cheese or lemon sauces make good complements to cauliflower. it can be served alone as a side dish or mixed with other vegetables in a medley. Choosing: Look for white or cream-colored heads that feel heavy for their size. The deeply ribbed green leaves that envelop a head of cauliflower should look fresh, not wilted or yellowing or dry. You may also find Italian purple cauliflower or golden green "broccoflower" at some markets. These are fun alternatives (particularly for vegetable platters) and can be used just like the more common white cauliflower. 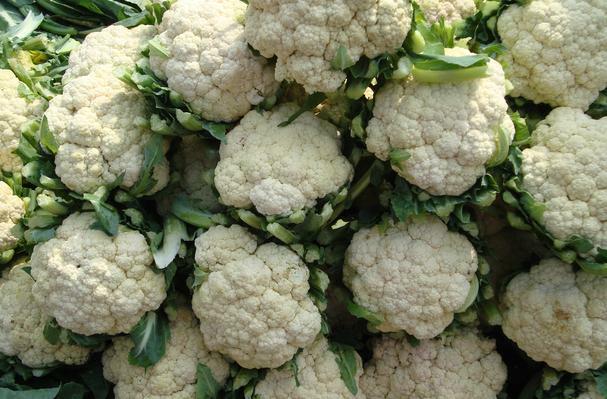 Buying: Fresh cauliflower is available year round and almost all grocers. Frozen cauliflower or prepared cauliflower entrees are available in the frozen food section of nearly every grocery store. Procuring: Cauliflower has a reputation for being hard to grow. Though it's a cool-season vegetable, it can't tolerate weather that's too hot or too cold, and it needs special treatment, called blanching, to retain its white color. Fortunately, new varieties are more tolerant than their forebears. Choose a site that gets full sun. The soil should have a pH of 6.0 to 7.0 and must be well-drained, evenly moist and amended with plenty of organic matter. Start early varieties indoors about a month before the last expected frost. Move the plants to the garden when they're about 6 inches tall, all danger of frost has passed, and temperatures of both air and soil have warmed to about 50 degrees F. Set the plants in their holes, cover them just short of the bottom leaves, and build a little saucer of soil around each plant to help hold moisture. Sow seeds directly in the ground for a fall harvest. Place them in clusters of four seeds each, with the clusters 2 feet apart. When the first true leaves appear, remove all but the sturdiest seedling from each group. Keep cauliflower plants evenly moist; especially when they're small, they need about 1 inch of water a week, whether from rain or the garden hose. Start the blanching process when the flower head (also called a curd or button) is about the size of an egg. Make sure neither it nor the foliage is wet; otherwise the plant may rot. Loop heavy twine around the leaves, gently lift them up and tie them together. The aim is to keep light and moisture out, but to let air in and also leave room for the flower to grow inside its shelter. Harvest cauliflower heads when they're full but before the sections begin to loosen. The timing depends on the variety, so start checking plants daily when the heads reach 3 to 4 inches across. You might want to try planting Orange Bouquet, which is a pale orange variety that matures in 60 days, needs no blanching and packs a big load of vitamin A.
Cauliflower can be roasted, boiled, fried, steamed or eaten raw. When cooking, the outer leaves and thick stalks are removed, leaving only the florets. The leaves are also edible, but are most often discarded. Cleaning: Cauliflower should be washed and removed from the stem. It can be cut into bite-size florets, perfect for dipping or eating in salads. Cut cauliflower into florets. Blanch for 3 minutes. Freeze in freezer-safe containers. Keep cauliflower loosely wrapped in plastic in the fridge. Fresh from the market heads will last up to 2 weeks. You can cut cauliflower into florets and stored them, sealed, in a plastic bag in the fridge. They will last up to a week in a well-regulated refrigerator. Mark Twain said, "cauliflower is nothing but cabbage with a college education." History: For such a highly modified plant, cauliflower has a long history.They had been introduced to France from Genoa in the 16th century, and are featured in Olivier de Serres' Théâtre de l'agriculture (1600), as cauli-fiori "as the Italians call it, which are still rather rare in France; they hold an honorable place in the garden because of their delicacy," but they did not commonly appear on grand tables until the time of Louis XIV.